Alison Walls reviews Jaclyn Backhaus and Andrew Neisler’s nostalgic tribute to America’s pioneering spirit. Folk Wandering is an exercise in nostalgia. Bare wall beams define the playing space and extend into the auditorium, providing shelves for trophies, photos, long-obsolete objects, and other knick-knacks, which also fill the boxes and various furniture items onstage. The whole suggests a basement (a suggestion later confirmed by the dialogue): the kind of basement one imagines exists in porch-fronted old homes of towns across America. The fact that their existence is doubtless exaggerated by Hollywood films also trading heavily in nostalgia is, for this show, beside the point—or perhaps, part of the point. Andrew R. Butler enters as a narrator figure, apparently named “Talisman,” establishing in his light interaction with the audience the storytelling frame of the performance. The rest of the cast enter and we come to understand that they are gathered there to go through this assortment of as yet anonymous memorabilia, free to take whatever they find and, for their own idiosyncratic reasons, love. Each object sparks one of the three central narratives and an imaginative transformation of the cast from a collection of vaguely hipster and probably millennial, but otherwise largely unidentifiable people in 2018 to figures from U.S. history—journeying to tenement Manhattan in 1911, the deserts of Utah in 1933, and small-town Indiana in 1955—though not in as linear a fashion as one might expect, even allowing for three different narratives. A hint of one character’s story might be quickly evoked, before the thread of another is picked up. The publicity material also leads one to expect more sharply defined central characters for each tale of American struggle. While, however, Rosealia (Lena Hudson), Kai (Kim Blanck), and Hannah (Morgan Siobhan Green) do eventually emerge as the protagonists of their respective narrative arcs, it is not immediately apparent, as other characters occasionally seem to initially drive the action. This is both a strength and a weakness. 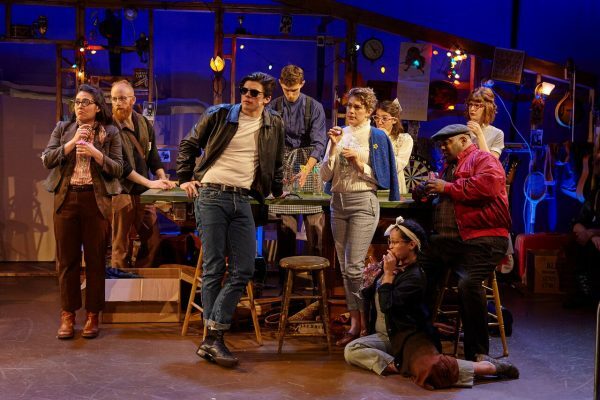 On the one hand, the overall excellence of the ensemble is one of the joys of this production. The cast appear to take genuine pleasure in each other’s work, relishing their scenes together or providing energetic and polished back-up to solo work. Each performer is given an opportunity to shine, but this is also a production where your attention can safely wander to background performers whose acting, singing, and choreography is as committed as when they are center-stage. Indeed, it is an indisputably positive side-effect of an ensemble cast where each member is required to sing a solo that the back-up vocals, adeptly arranged by Mike Brun and Joel Esher, under the music direction of Ellen Winter, are rich, nuanced, and generally excellent. The same can be said for the simple, but delightful movement, choreographed by Ben Hobbs, and the on-point comedic touches from the entire cast throughout. On the other hand, where Folk Wandering attempts to plumb more profound emotional depths, the production suffers from a lack of any really strong connection to the key characters. We come to Hannah’s story, for instance, through her troublesome ex and band member, Bobby (Adrian Blake Enscoe, a convincing James Dean look-alike). Her role initially seems secondary to a primarily comedic scenario, and so when her heartbreak finally emerges as the key theme to that particular narrative thread, her loss does not resonate quite as forcefully as it needs to, despite a compelling performance by Siobhan Green, whose voice shifts ably from attitude-laden rock n’ roll style tones to haunting lyricism. Similarly, although Roselia and Kai’s respective narratives are more clearly their own, the denouements of each—one tragic, one triumphant—somehow lack the emotional impact they deserve. Again, this is through no fault of the actors, both of whom are excellent. Hudson has the audience eating out of her hand as a precocious (perhaps not strictly historically accurate) early 20th century 13th year old and Blanck lends beauty and nuance to a tough, dust bowl stricken and widowed young mother. The other performers, who cannot rightly be termed supporting, likewise demonstrate both comedic and dramatic chops, along with superb voices. The actors’ ability to shift deftly from one character to the next is enhanced by Heather McDevitt Barton’s savvy costume design, which allows the performers to plausibly embody their current-day personas, while the swift addition of one or two costume items satisfyingly evokes the various bygone eras. Carolyn Mraz’s scenic design similarly creates a flexible environment that underscores the production’s basic concept of conjuring up personal histories through objects. Christopher Bowser’s atmospheric lighting design also contributes to a visually engaging production and smooth scenic transitions. The overall coherence and quality of the scenic and performative elements of Folk Wandering (and mention must be made too of musicians, Blake Allen, Mike Brun, Magda Kress, Sydney Shepherd, and Ellen Winter) disguise some of its shakier dramaturgical elements. The book by Jaclyn Backhaus showcases a delightful facility with language and is basically strong on a scenic level, but does not seem to know where to land in conclusion. What feels like a false final number suggests a rather profound philosophical commentary on the very nationalistic nostalgia in which the production indulges, fleetingly probing at the problems inherent in our love of the twee and the cliché (hammy Italian accents, check), but this is then undercut by a number that, however lovely, diverts us back to a more superficial, personal level. These concerns do suggest, however, the spirit of exploration that seems to have admirably driven the production from its inception. The seven years already dedicated to its development are in evidence and Folk Wandering will hopefully develop further still. If Folk Wandering were to truly address the knotty questions it tentatively hints at, such as the role of nostalgia in shaping the collective U.S. psyche and the myth of the American dream, it would be a truly remarkable piece. As it stands, the collaboratively created songs (Blake Allen, Mike Brun, Andrew R. Butler, Joel Esher, Jo Lampert, Barrie McLain, and Annie Tippe all worked on music and lyrics, with music also by and Alex Fast and Dominique Toney and lyrics by Jaclyn Backhaus), which take advantage of the various time periods to have fun with a range of styles and serve up several little gems, along with the engaging scenic work, and stellar ensemble performance under Andrew Neisler’s skillful direction make Folk Wandering a thoroughly enjoyable new musical. Pipeline Theatre Company is one to watch. Folk Wandering runs to March 25, 2018. More production info can be found here.